This procedure is designed to determine findings of fact and whether research misconduct has occurred or not. Any findings of fact relating to research misconduct reached through procedures described in PPL 4.20.10b Research Misconduct - Higher Degree by Research Candidates - Procedures may then be addressed through the University’s provisions for managing academic misconduct via PPL 3.60.04 Student Integrity and Misconduct. Academic misconduct - is conduct on the part of a student that is defined as academic misconduct in section 6.1 of PPL 3.60.04 Student Integrity and Misconduct Policy. General misconduct - is conduct on the part of a student that would amount to general misconduct in section 6.2 of PPL 3.60.04 Student Integrity and Misconduct Policy. The Code - Australian Code for the Responsible Conduct of Research (2018) or any subsequent published revision thereof. 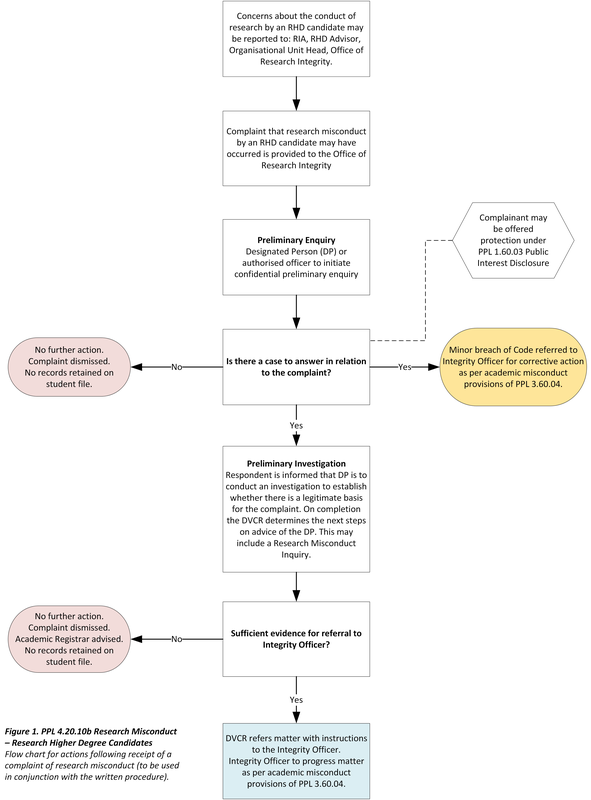 This procedure applies to all HDR candidates and details the steps for managing complaints of research misconduct made against HDR candidates. Complaints of academic or general misconduct made against HDR candidates are addressed through the provisions for managing general misconduct via PPL 3.60.04 Student Integrity and Misconduct. The University considers complaints of research misconduct as a serious matter. Students must conduct themselves in a manner consistent with the standards set out in PPL 4.60.02 Higher Degree by Research Candidate Charter. Staff involved in research misconduct or appeals processes must disclose actual, perceived or potential conflicts of interest (whether personal, financial or otherwise) as soon as they become aware of them according to PPL 1.50.11 Conflict of Interest. 6.1 When an individual has concerns about the conduct of research involving an HDR candidate, including potential research misconduct, the individual is encouraged to consult and seek advice from a Research Integrity Advisor (RIA) in relation to their concerns before electing an action in points 6.2 to 6.4 below. 6.9 Depending on the nature of the disclosure, the complainant may be offered protection under PPL 1.60.03 Public Interest Disclosure. Nothing within these procedures precludes the DP or their authorised officer making reasonable efforts to resolve breaches of the Code informally provided these actions are consistent with the Code, PPL 3.60.04 Student Integrity and Misconduct (Counselling for Alleged Misconduct) and PPL 4.20.02 Responsible Conduct of Research. 8.3 If, in the assessment of the DP or their authorised officer, the matters may constitute a minor breach of the Code, the matter should be referred to the Integrity Officer to determine appropriate corrective action which may include referral to a level 1 or level 2 decision-maker in accordance with the provisions of PPL 3.60.04 Student Integrity and Misconduct. 8.5 If, during the preliminary enquiry stage, it is identified that the complaint may wholly comprise, or include aspects of potential general misconduct, these general misconduct matters will be referred through the provisions for managing general misconduct via PPL 3.60.04 Student Integrity and Misconduct to the Academic Registrar. 8.6 A student who makes a complaint or complaints which are considered to be frivolous and/or vexatious concerning the actions or omissions of an HDR candidate or staff member may be dealt with in accordance with PPL 3.60.04 Student Integrity and Misconduct as a matter of general misconduct. 10.8 The inquiry panel will provide a written report to the DVCR. The DVCR must consider the recommendations and determine whether the matter be referred to the Integrity Officer to initiate Academic Misconduct proceedings as per PPL 3.60.04 Student Integrity and Misconduct. 11.1.1 Subject to the requirements of privacy legislation and PPL 3.60.04, the DVCR must inform all relevant parties of the findings from the research misconduct inquiry and, where appropriate, the actions taken by the University: relevant parties may include affected staff and students, research collaborators, including those at other institutions; journal editors; and professional registration bodies. The public record, including publications, may need to be corrected if research misconduct has affected the research findings and their disseminations.